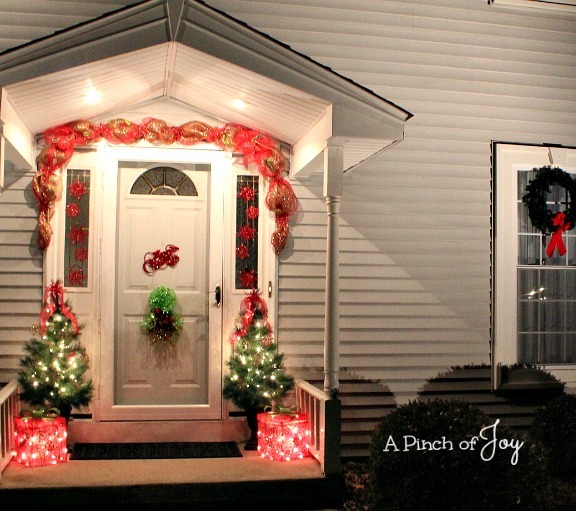 The front porch is all decked out in its Christmas finery.Some new, some old. A bit of tradition, a bit of contemporary neon. 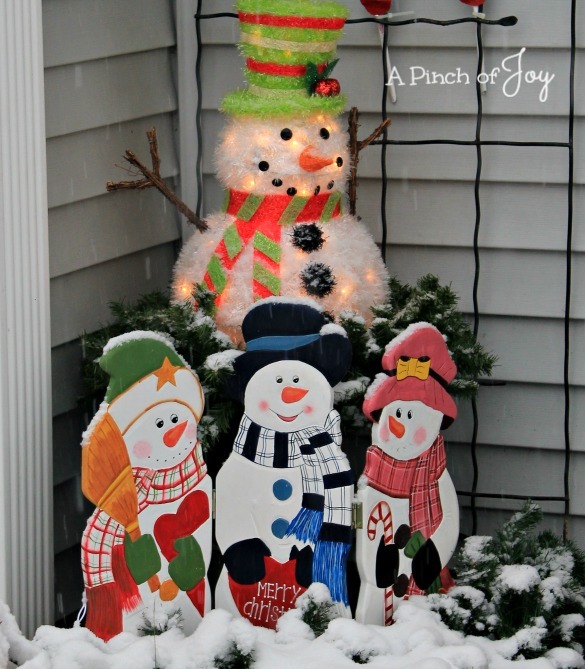 Snowflakes are the theme this year. In glittery red and gold. 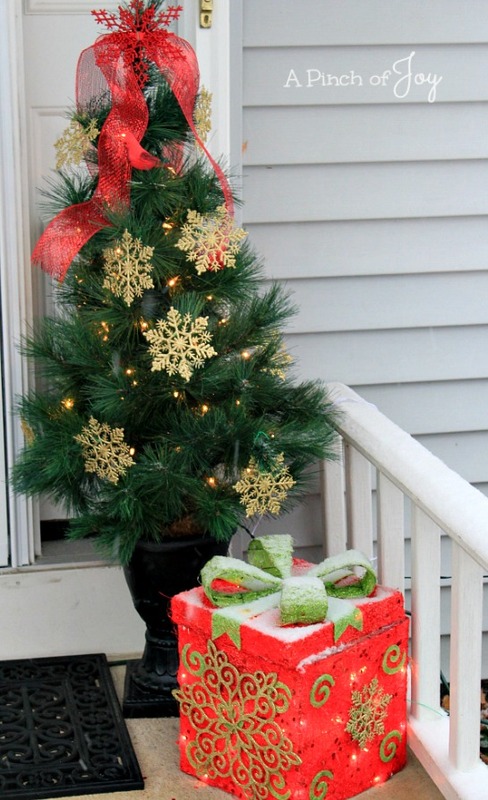 Add the lime green bow and swirls on the snowflake decked packages. And at night they really glow. I have to go tuck that electrical plug back out of sight. The little red cardinal cheeps cheerfully whenever anyone walks by. I like it. Even if someone found it a little unnerving to have a bird chirping at night when they rang the doorbell. We had a good laugh. Maybe that’s why I like it! I made a new garland this year. It didn’t take a lot of time or money — those things are precious this time of year! 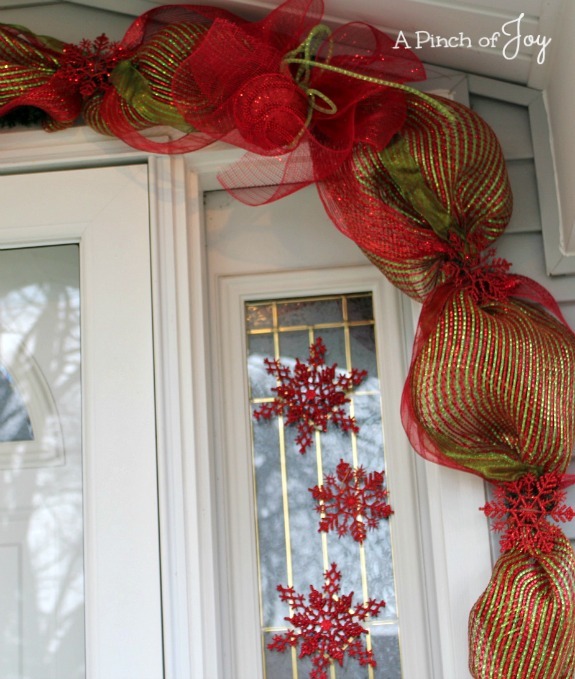 I showed you how I made a simple garland and said I would show you how I embellished it. I found these fabulous glittery snowflakes at the dollar store. You probably won’t find any now at your dollar store. Particularly if you go to the same one. I bought the last three packages. 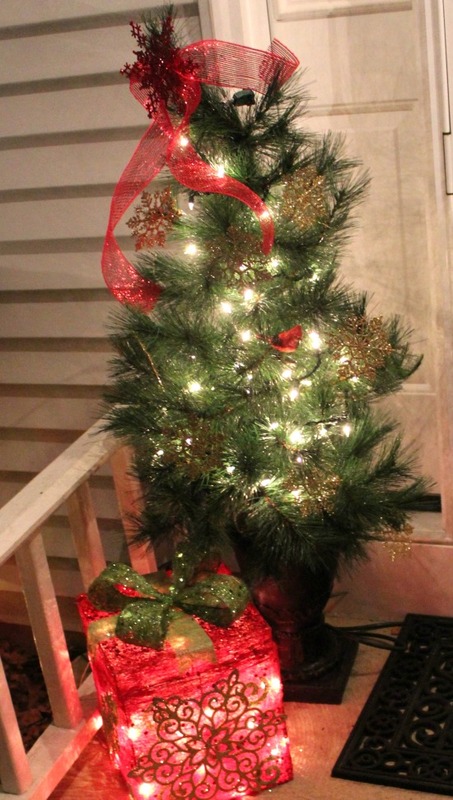 The flat snowflakes helped keep a low profile so the garland didn’t overwhelm the small space. 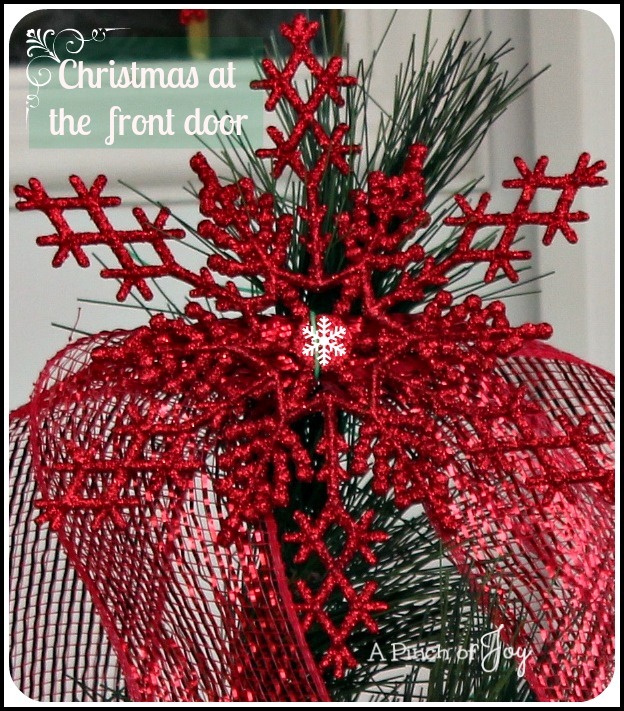 The corner embellishment features a dollar store glittery ball and a mesh bow. There was a little neon green tube mesh left from the Halloween wreath, so I added it to the bow. The red snowflakes are stuck to the glass with sticky tack /putty stuff. I thought they might pop off in the cold but it’s 24 degrees right now and they are still stuck. Just to keep things balanced! and holds the bow and ball to the garland. Bytes used a binder clip to fasten the chenille stem to the metal trim across the top of the door. Pretty important part, that chenille stem! Flexible, influencing even when not seen and sturdy! Holding it all together. Kind of like a mom. The tail end of the garland. We stretched the final pouf to get a bit more length. You can just barely see the binder clip that holds it in place. 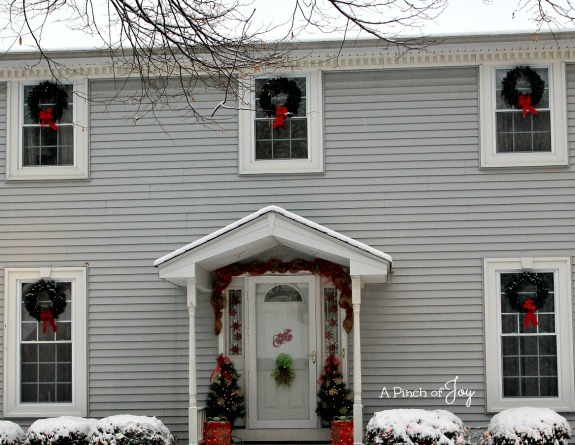 The whole garland is fastened to the house with those binder clips. 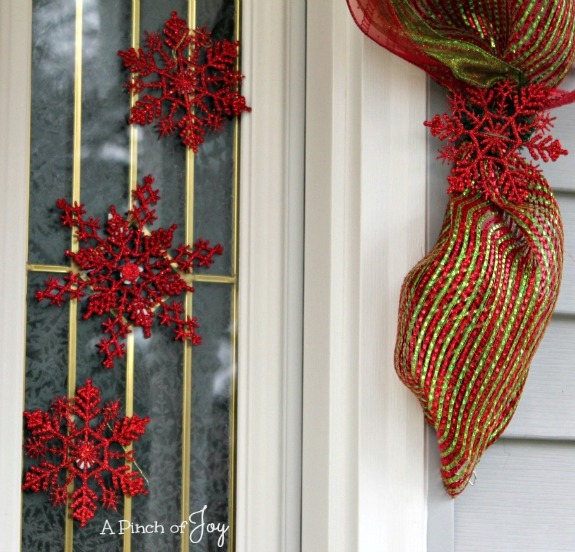 Add a Merry Christmas in glittery red and a door swag quickly made. 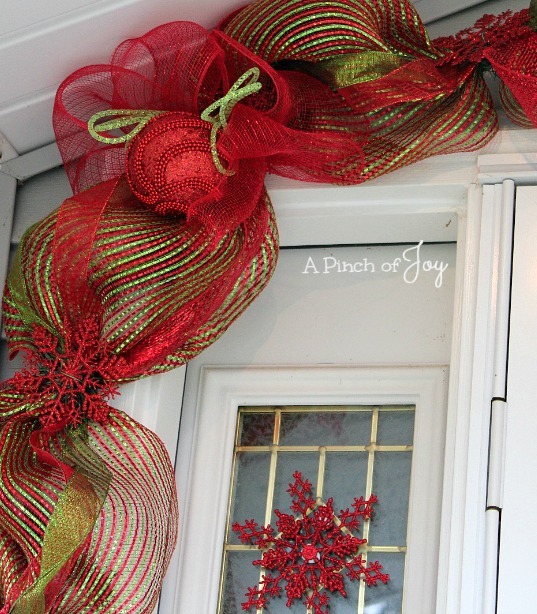 makes the beribboned wreaths on the windows pop. where the garage is set back from the house. standing in the new neighbor’s driveway. 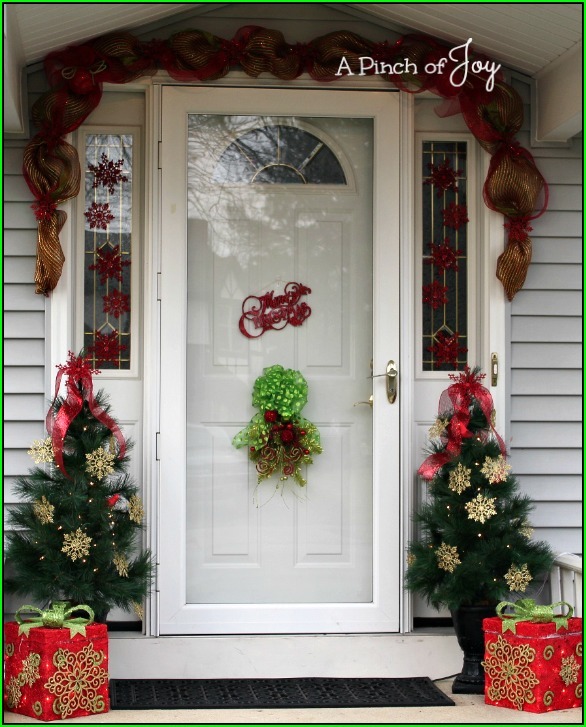 As a fellow wreath lover, I love your home’s exterior! Jenny@EvolutionofStyle recently posted…Dude, Where’s My Car(d)?